• The Beginning - A fascinating look at the genesis of Star Trek: The Next Generation and Gene Roddenberry's vision. • Selected Crew Analysis - First-season cast members discuss their roles. • Making Of A Legend - Featuring first-season production staff reminisching about their favorite episodes. • Memorable Missions - Featuring cast and crew discussions on key episodes and events occurring in the first season. Bizarre but true: before March 2002, I’d never seen an episode of any Star Trek program other than “The Original Series”. I’m sure I’m not alone in that regard, as plenty of people never watched any of the various series. However, the part that makes it weird stems from the fact that I like Trek. I’ve seen every episode of “The Original Series” and I’ve also watched all nine Trek movies, which includes the three with the cast from Star Trek: The Next Generation. Despite my virtually lifelong interest in Trek, however, I simply never got around to any of the other shows. No Voyager, no Deep Space Nine, no Enterprise, and no Next Generation. Again, I’m very familiar with the cast and setting of that last show since I’ve seen the films, but never did I actually watch an episode of the TV series. Now that Paramount have begun to release ST:TNG on DVD, that’ll change. Boy, will it change; they plan to put out all seven seasons within one year! As such, I have my work cut out for me - that’s a lot of Trek! Of all four spin-offs from “The Original Series”, TNG was the riskiest because no one knew how audiences would react to a different crew aboard the Enterprise. Actually, TNG wasn’t the first televised extension of the original show. NBC aired an animated series in 1973; it involved the original cast as voice actors but only lasted one season. More intriguing was a new series that almost came to life in 1977. Called Star Trek: Phase II, this program would have mixed original cast - with the notable exception of Leonard Nimoy, then involved in nasty legal wranglings with Paramount - and new actors. However, they pulled the plug on that show right before shooting began; the success of Star Wars encouraged the studio to aim higher, so the series died so they could make Star Trek: The Motion Picture. That film did well and spawned a series of sequels; we got four Trek films with the original cast before the show’s creators decided it was time for something new. And with much ado, they launched Star Trek: The Next Generation in the fall of 1987. Frankly, I can’t recall the exact reception the program got, but I don’t think it became an immediate hit. I know some “Original Series” stalwarts didn’t embrace it; one friend of mine loved the show and almost unilaterally dismissed TNG after one viewing. I seem to remember fairly mixed reviews as a whole back in the early days. 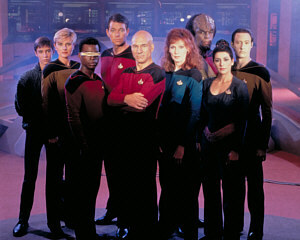 Nonetheless, even after a somewhat rocky start, TNG emerged as a success in its own right. The show had the same Trek vibe fans loved but it didn’t simply replicate the adventures of the original crew. Had TNG flopped it likely would have killed the franchise, at least for any opportunities beyond those available for the original cast. Its success enabled Trek to turn into the giant franchise it’s become. Whether that’s good or bad will remain up to others to decide. 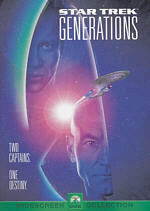 In any case, I look forward to taking my own journey through the seven seasons of Star Trek: The Next Generation. Of course, this starts at the beginning, with the initial 25 episodes of season one from 1987-88. These shows will be discussed in the order broadcast, which is also the way in which they show up on the DVDs. 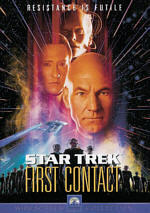 Episode 1: Encounter at Farpoint launched ST:TNG with a bang. A double-length episode, this one introduces us to the new crew of the Enterprise in a pretty solid manner. Freshly appointed Captain Jean-Luc Picard (Patrick Stewart) meets and greets his charges and they immediately enter the soup when a powerful being called “Q” (John de Lancie) appears and threatens the ship. He declares that humans are barbaric and challenges the Starfleet personnel to prove otherwise. They have to complete a diplomatic mission to a station called Farpoint, and “Q” will judge the results. On the negative side, “Farpoint” tries to pack too much into its length. The show attempts to provide a fair amount of exposition for most of the new characters and feels like it wants to fit a season’s worth of material into one show. Nonetheless, it’s still a good introduction to the series. “Q” is an entertaining and intriguing new villain, and though the show uses the same “omnipotent manipulative force” theme seen often on the original series, it does so in a reasonably clever and fun way; it even shows some self-referential indicators that make the program more enjoyable. “Farpoint” bites off a little more than it can chew, and it suffers from a squishy and sappy ending, but I feel it offers a good start to the series. Trivia note: “Farpoint” provided the sole cameo from an “Original Series” crewmember. 137-year-old Dr. McCoy (DeForest Kelley) makes an inspection tour of the new Enterprise. It’s a gratuitous moment that exists just to offer a tangential connection between the series - frankly, I could have lived without it. Episode 2: The Naked Now updates an episode from the first season of “The Original Series”. “The Naked Time” was that series’ fourth broadcast that showed the crew of the Enterprise as they got infected by a mysterious force that made them all act out in immature and silly ways. Apparently, the same disease affects the TNG crew, and they get into dire straits when an exploding star threatens the incapacitated ship. I thought it seemed a little early for this kind of show. We saw the crewmembers as they acted out of character, but their personalities hadn’t been developed yet. I also felt it was a bit lazy for them to echo an original episode so soon; they should have tried harder to branch out from that series. Still, the show was generally entertaining. It offered nothing new or exciting, but it appeared reasonably fun and watchable. Episode 3: Code of Honor gave us half of a good episode. We meet the inhabitants of the planet Ligon II, led by Lutan (Jessie Lawrence Ferguson). Their world contains a natural cure for a disease running rampant, and the Enterprise has to negotiate access to it. They follow the Ligonian rules but Lutan becomes enamored of Yar and kidnaps her. From there, Picard and the others have to rescue their colleague while they try to get the medicine as well. To be frank, much of “Honor” came across like a civics lesson. We learned about accepting and understanding difference cultures, and the show could be somewhat preachy at times. Still, it was fairly interesting during the first half, during which the Ligonians came across as reasonably interesting people. The second half started to collapse, however, especially as we watched Yar’s (Denise Crosby) catfight. “Honor” remained okay as a whole, but it wasn’t one of the better episodes. Episode 4: The Last Outpost introduced a villain new to TNG, the Ferengi. They steal a piece of Starfleet equipment, so the Enterprise chases them. They come to a halt and seem to take control over the ship. However, it turns out that they’re in the same boat; they think the Enterprise controls them! It turns out that a third party has affected both. Small parties of each race beams down to the local planet surface where they try to resolve the problems as the ships above struggle to survive their loss of power and resources. I don’t know how the Ferengi will develop over time, but through my initial encounter, I didn’t like them. Of course, we’re not supposed to care for them, but that’s not what I mean. I thought they were over the top and annoying characters to watch; they weren’t compelling to me in a provocative and interesting manner. Otherwise, however, “Outpost” offered a good episode. It provided an intriguing mystery and kept me interested until its conclusion. I thought it focused on too much goofy comedy with Data (Brent Spiner), and it also suffered from the exceedingly obnoxious performances of the actors who played the Ferengi, but it remained a pretty solid episode. Episode 5: Where No One Has Gone Before sends the Enterprise to the ends of the universe - literally. Arrogant technical officer Kosinski (Stanley Kamel) arrives on the Enterprise to optimize the engines. The crew can’t make sense of his equations, but when he comes on board with his assistant (Eric Menyuk), a test run shows that the ship can reach unbelievable speeds. The Enterprise flies an unbelievable distance, and problems regard how they’ll get back home. ”Before” was another good but unexceptional episode. It started strongly, partially due to the grating character of Kosinski. So many Starfleet personnel are namby-pambies; it’s fun to see such a jerk. Otherwise, it was a pretty mediocre show. Its hippie-drippy tone with its thought-powered travel was a little lame, and I’ve begun to tire of plots in which Wesley (Wil Wheaton) knows best but no one listens to him. Nonetheless, “Before” remained decent. Episode 6: Lonely Among Us puts the Enterprise on a mission to transport the warring races of the serpentine Selay and the canine Anticans to a parliament. Along the way, a mysterious electric force infects the ship and takes over different members of the crew. The problems remain difficult to resolve, but various personnel try to restore their control over the ship. ”Lonely” offered some intriguing moments but fell a little flat as a whole. The primary problem stemmed from the conflict between the Anticans and the Selay. They existed as a diversion, essentially, for they had virtually nothing to do with the main plot. They seemed like a red herring that didn’t go anywhere. The rest of the plot worked well enough on its own that those elements were unnecessary. Data’s Sherlock Holmes act was too cutesy, and the ending was excessively clumsy. The show didn’t resolve in a natural manner and the finale was a bit silly. Still, the rest of it was reasonably intriguing, so “Lonely” remained decent. Episode 7: Justice took the Enterprise to the idyllic planet of Rubicam 3. There they find a race of blond hunks and babes who live just for pleasure. There’s virtually no crime on the planet for one good reason: every infraction - no matter how small - earns the death penalty. Wesley inadvertently crosses the legal line, so the rest of the episode follows Picard’s attempts to keep the boy alive while he remains within Starfleet regulations and requirements. Of the episodes seen so far, “Justice” reminded me the most of “The Original Series”. The Edo resembled the Vaal from “The Apple”, and they were portrayed in a fairly simplistic and naïve manner. However, while the plot itself felt a bit tired, the path the episode took to resolution stood out as unusual. I won’t discuss the ending, but suffice it to say the show didn’t wrap up matters into a neat and tidy package. “Justice” wasn’t a great episode, but it succeeded as something that was nicely subtle and intriguing due to its refusal to follow an easy path. Episode 8: The Battle brings back the Ferengi. It also explores parts of Picard’s past. The Ferengi plot revenge against the captain due to his prior attack of one of their vessels. It seemed warranted, but the Ferengi captain doesn’t agree and he wants to exact his pound of flesh. The Ferengi remain somewhat obnoxious, but they show greater depth here. The actors toned down their emoting, and we even got some nice depth of character from the Ferengi first officer. After a while, it became obvious where the story would go, but I liked the discussion of Picard’s past, and overall I found this to be a good, tense episode. Episode 9: Hide and Q offers a return visit from the premiere episode’s star. Intrigued by Riker (Jonathan Frakes), Q decides to give the first officer a serious temptation. He grants Riker the power of the Q, and the officer needs to decide what he wants to do. I found this to be a pretty mediocre show. For one, I felt it was too soon to revisit Q; he’s a good character, but a little goes a long way, and we didn’t need to see him so quickly. The show seemed somewhat gimmicky and predictable, and it also came across as a bit silly at times. Q lost some luster from his quick reappearance, and not much depth appeared. Overall, it wasn’t a bad episode, but it seemed to be below average. Episode 10: Haven introduces Counselor Troi’s (Marina Sirtis) mother Lwaxana (Majel Barrett). It turns out that Deanna has been betrothed to Wyatt Miller (Rob Knepper), and the wedding now needs to take place. They get to know each other and hit it off fairly well, but he’s haunted by visions of a mystery woman. It’s obvious where things will go. We know Deanna won’t marry Wyatt, but it’s a reasonably entertaining ride. Lwaxana offers an amusingly broad presence; Barrett overplays her to a degree, but she’s still fun. Wyatt’s possibly the wussiest character in Trek history, though; I was quite happy to see him go. Anyway, the show had some silly parts - such as the involvement of the Tarellians - but it’s a decent program as a whole. Episode 11: The Big Goodbye offers the first serious exploration of the Holodeck. The Enterprise needs to perform a diplomatic mission to visit the insect-like Jarada; Picard must deliver a message, but the Jarada are exceptionally picky about how their language is articulated, so he’s under a lot of stress to perfect his text. To relax, Picard engages in a Dixon Hill detective story in the Holodeck, but inevitably, things go wrong, and problems ensue. This was pretty mediocre episode. The Dixon Hill stuff got too cutesy, especially when Data embraced the concept. It also became rather predictable when the Holodeck began to malfunction and the Jarada got impatient. The show had some decent moments, and I liked the culturally unique aspects of the Jarada, but this remained a lackluster show. Episode 12: Datalore explores the origins of our favorite android. The Enterprise travels to the Omicron Theta system, which is where Data was discovered years earlier. While there, they find another version of Data. Named Lore (Spiner again), it turns out that he was built first and he has his issues. Pretty soon we learn of Lore’s dark side, and Data needs to come to terms with his “brother’s” nasty habits. In truth, “Datalore” offers little more than a Trek take on the old “evil twin” plot. While fun at times, I thought the show was a missed opportunity. It could have provided greater depth as it examined Data’s history, but once it became clear that Lore was a baddie, the show devolved into silly action. We also get more “Wesley knows best” - the most annoying continuing theme of the first season - and the worst scoring of the year when Lore and Worf (Michael Dorn) fight. “Datalore” stands as a decent but flawed episode. Episode 13: Angel One takes the Enterprise to the planet named in the title. They go there to locate lost crew from a ship called the Odin. Angel One features a female-oriented society in which women are physically stronger than men and they run the joint. Led by Mistress Beata (Karen Montgomery), they moderately resist this endeavor, for reasons that become obvious later in the show. In addition, Beata seduces Riker, and a mysterious illness rocks the crew left on the Enterprise. I felt “Angel” was a pretty lackluster episode that featured rather bland and predictable twists. Much of it seemed like a cutesy excuse to show gender-related role reversals, and also to let Riker get some action. When I first heard of TNG, I thought Riker seemed like a Kirk-copy, and this was his most Kirk-related part to date. That’s not a bad thing per se, but it felt somewhat forced, and the program was watchable but nothing terribly fascinating. Trivia note: “Angel” gives us the first TNG mention of the Romulans. However, they don’t appear just yet; that won’t occur for a little while. Episode 14: 11001001 puts the Enterprise in spaceport for some computer upgrades. A twitchy race named the Bynars performs the work, but we quickly learn that they have something up their collective sleeve. They hijack the ship to restart their planet’s main computer, a device to which all Bynars are connected and need to survive. The show follows the crew’s attempts to regain control and also help the Bynars. This seemed like a decent program. On one hand, it became fairly predictable, especially once the Bynars’ deception made itself clear. 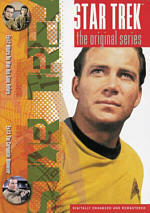 Nonetheless, it offered a good ride, especially since it largely featured Riker and Picard on their own. Is it just me, or does Commander Quinteros (Gene Dynarski) look a tremendous amount like Picard with a beard? Episode 15: Too Short a Season plops elderly Admiral Jameson (Clayton Rohner) on the Enterprise. He needs to go to Mordan IV to negotiate a hostage crisis. However, it quickly becomes clear something’s up, as the decrepit admiral starts to regain physical capacities long gone. We also learn the specific reason why Karnas (Michael Pataki) - the captor involved - will only deal with Jameson. “Season” occasionally managed to seem intriguing, but too much of it appeared predictable. From moment one, it was clear that a young actor in old-age make-up played Jameson, so this telegraphed the changes that would occur. That also meant a lot of the “twists” became more easily anticipated. The show had some moments, but it remained pretty average.